This gallery is only open during the opening reception -- but you can view the exhibit for the next month if you want to buy some art -- or if you have any business at the Weekly Dig office. It turns out that you'd walk through the artspace on your way to the workplace. 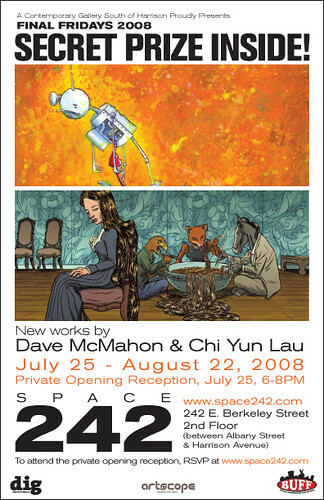 Supposedly the first major exhibition for both artists, they've done quite a bit on the local art scene. (e.g. Dave is involved with running Bazaar Bizarre and Magpie.) Their work is quite vivid and stimulating. You definitely won't need to try too hard to enjoy this stuff that might include "sad robots, angry mutant vegetables, humanized sushi, mechanical insects, alien ghosts, and a zombie roller derby". Refreshments will be served, and it seems like the Dig staff are quite the boozers (in my limited experience of hanging with some). The artists and other cool people will be there. I might be there too. You might still ba able to RSVP to attend. If you're wondering where it is, it's next to Medieval Manor.